been going on for a long time now with nothing being done about it. budget and divert it to the health sector. that health care is and should be a priority? people on board. 14 passed away and the rest were left to fend for themselves. they under the same medication? Is this not a high risk to the patients? I do not understand. our enemies; Seen and Unseen I guess. Now why do you think I am making noise? happened: he got seconds when he couldn’t feel his head. agreed that he would go to India for surgery. Now this did not happen overnight. : the latter on the lumbar. However, not so many have been as lucky as he is. overhaul the health sector.” Just malaria, how about the number of babies who lose their lives at birth? and the number of women who die giving birth because there was no one to attend to them during their giving birth? celebrating 50 years of Independence. 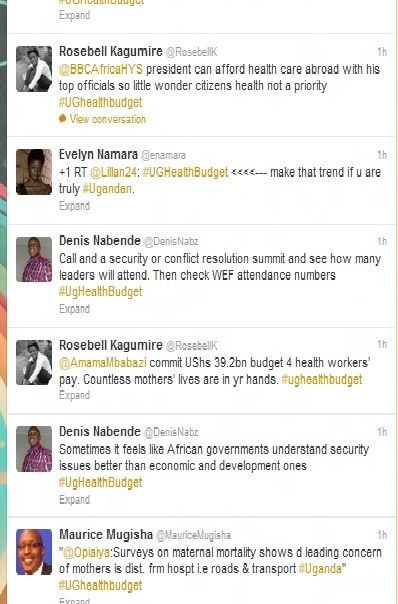 For more tweets: Follow the hashtag: #UghealthBudget. Looks like there'd be no point setting up medical assistant training schools in uganda if the situation worsens further. If this incident continues I don't think health clinics and care centers will find it difficult to search for possible staffs. Good thing the glendale urgent care knows how to treat their staffs right. Hopefully the government will see to it that health care is well-attended, especially the basic ones that might lead to serious illnesses, such as colds and cough. Even sinusitis, it' best to buy nasonex as soon as symptoms arise because this can greatly affect one's productivity at work.